It's a smartphone! It's a tablet! No, it's a phonenetlet! The Asus PadFone is a bit of an odd duck, so it's no surprise it's taken this long for it to reach U.S. shores, even without being picked up by a carrier. But reach them it has, and the unlocked Asus PadFone is being sold by "grey market" retailers in tandem with its tablet docking station at $859.50 for the 16GB model, $959.50 for 32GB, and $1,059.50 for 64GB. Currently the only retailer selling the phone is Negri Electronics, "your trusted source for high end unlocked wireless," though the larger two options are only available for pre-order, and the 16GB model is on backorder as of this afternoon. The PadFone is what TechRadar likes to affectionately refer to as a phonenetlet - that is, a phone, a netbook, and a tablet all in one. But the version available in the U.S. only comes with the tablet station, and not the netbook-like keyboard dock or other accessories like the nifty Bluetooth stylus/handset or the desktop monitor docking station. 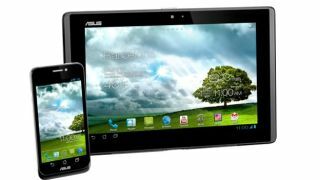 The Asus PadFone is a 4.3-inch Super AMOLED smartphone with a Qualcomm Snapdragon dual-core 1.5GHz processor and an 8MP camera on the back. Those specs aren't bad, but where the phone really stands out is in its ability to transform instantly into a 10.1-inch Android tablet. The tablet performed well in TechRadar's tests, but if that's not your thing, then you can always just plug that into the device's keyboard docking station, turning the entire thing into an Android-powered netbook. The mentioned Bluetooth stylus/handset pulls double duty as an input device for the PadFone's tablet form and a way to answer calls without holding the 10.1-inch form up to your face. Is there an official release in store? Anyone picking up the Asus PadFone at this price will likely want the whole shebang, with all the accessories, but it appears that wait isn't yet over. An Asus representative confirmed to TechRadar via email that the company has not yet announced any specifics regarding the phonenetlet's official U.S. release. In the meantime, you'll just have to hold that tablet up like a phone and hope that nothing important's going on in your peripheral vision.